The giant dragonfly fossil was found, in 1912, in a piece of shale on the waste-tip of Tyning Colliery which is near Writhlington, Radstock. Later examination of the specimen by a German palaeontologist, Anton Handlirsch, revealed that it was different to the Meganeura in certain respects. Handlirsch renamed the dragonfly Boltonites radstockensis in honour of Dr Bolton: it is the type specimen. This unique fossil in now in the care of the Sedgwick Museum of Earth Sciences in Cambridge. The Carboniferous beds at Writhlington (Radstock Formation: UK) are from the Silesian Upper Coal Measures. In life the Radstock dragonfly had a wing span of 40 cm (16 in). These giant dragonflies probably lived on smaller insects which they may have caught in glades in swampy forests that were wide spread during carboniferous times. An artist’s image of the Radstock dragon fly featured on a First Day Cover of stamps of British Insects which was released in March 1985. 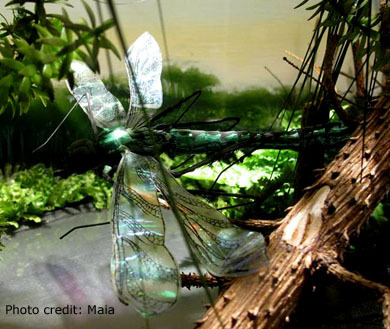 Radstock Museum has a half size display model of the dragonfly in its swampy habitat of 300 million years ago. We also have 3D images of the dragonfly fossil which, when viewed with the special 3D glasses, give a real glimpse into the past. 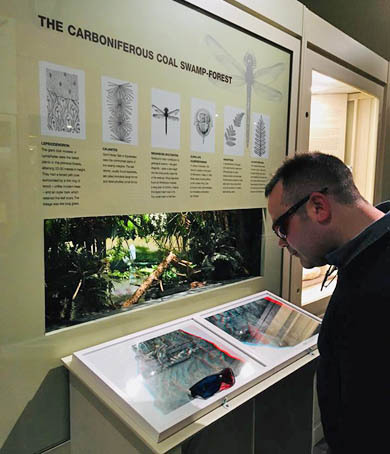 The 3D display was created in 2018 with help from the British Geological Survey and Sedgwick Museum of Earth Sciences; to whom we are most grateful.